Last week, my daughter was putting together a holiday gingerbread house. She was quietly humming to Christmas tunes on the radio, and was getting into the spirit while pasting gingerbread walls together with frosting. It was all as idyllic as a Currier and Ives greeting card until she walked away to answer the phone. When she came back, the entire house — including the walls, roof, and packets of decorative candy trim — were gone. GONE! That’s when we looked over at the obviously guilty parties, our Amstaff, Leo, and terrier, Baby. Their ears were pushed back against their heads as they licked their snouts with satisfaction. Grinches … that’s what they are. Greedy Grinches who “stole” Christmas. 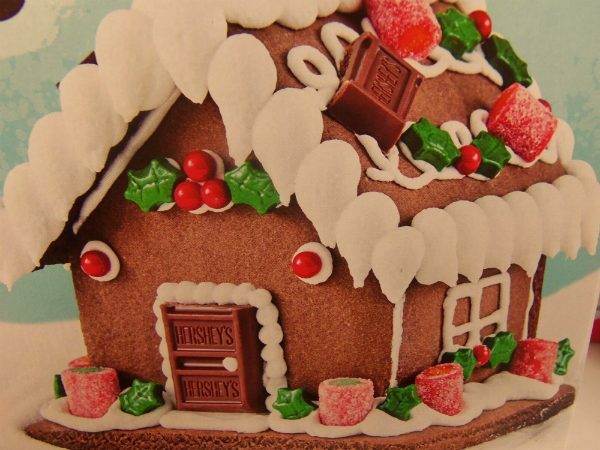 This is what the gingerbread project was SUPPOSED to look like. But no. We just can’t have ANYTHING nice in this house, especially during the holidays. They make it where we can’t have anything nice in this house. They make it where we can’t have a normal Christmas. Whether it’s ripping the stuffing out of our Hermey and Yukon Cornelius dolls from “Rudolph the Red Nosed Reindeer” or dragging my son’s special stocking around the house until it’s covered in hair and the trim is ripped off, these two would be as welcome in Whoville as a case of stomach flu would be in a daycare. Like the famous Grinch of Dr. Seuss, these two MUST be secretly conferring about — via doggie head nods, paw sign-language, or some kind of canine telepathy — how to totally ruin Christmas for us all. Terriers were bred for rooting out vermin, NOT rooting out Christmas plush from beneath our tree. Baby isn’t even ashamed to be caught in the act. They did it again yesterday, actually. We were gathering up gifts and wine bottles, all the stuff we bring to our yearly holiday gathering with extended family. So the little kids in the family would have candy, I had dumped several bags of Christmas sweets into a little red plastic basket. It was filled to the brim with delicious options: milk chocolates, shaped like Santa heads or coins; Hershey’s Kisses; Andes mints, with their metallic green wrappers that are so perfect for the holidays; peppermint taffy; Christmas-colored rows of Sixlets. I placed the basket far out of reach, on a sideboard, in a spot where the dogs could surely not reach it. I left the room for a few minutes, in a rush to finish getting ready for the party. When I returned, the basket was on its side, a handful of wrapped taffies lying there surrounded by several packs of untouched Sixlets. But the rest was GONE. You don’t want to know the word I said. It was much worse than what Ralphie said in A Christmas Story, if you can imagine such a thing. Nobody was there to make me eat soap in penance, but there were two Grinchy dogs staring at me and licking their dumb chops. My first thought was: Where are the wrappers? Then, I realized I was asking for entirely too much. The wrappers — the metallic Andes papers, the Hershey’s foils, the taffy wax paper — were by that time, making their way through doggie Grinch intestines. We’ll probably find them somewhere in the yard this spring, when we cut the grass for the first time of the season and find two scrunched-up little piles of Santa foils that had been deposited in unpleasant poop sessions. Luckily, the cheap chocolates were much more “milk” than “chocolate,” so there were no lasting effects to their health. But the Grinchly thoughtlessness of these two made for one less gift for the nieces and nephews. I couldn’t bring a basket with a few taffies with tooth impressions and wrinkly looking Sixlets. That was just lame. When I think back over the years, I’m astonished to realize how many Christmas traditions they’ve ruined. We can’t ever put gifts under the tree because they always seem to get into them in some way. So, unlike the idyllic holiday scene we’d all love to have, our gifts are always piled up on furniture in unattractive disarray. I also think of an old dog we had when my husband and I first married, Max. He was an awesome old German Shepherd mix we rescued from an existence of living outside on the end of a leash in the cold winters of Indiana. He was old and his lifespan was limited, but we knew even if he was only with us a few short years, we owed him a warm and loving home for as long as he had left. For the few years Max spent with us, he had so much gratitude, his body language always seemed to be saying “thank you.” Always. It’s as if he remembered what his life was before, and was thanking us for saving him. Unless it was Christmas, then even the wonderful old Max became a Grinch. After all the fiascos — the candies eaten, the gingerbread homes demolished, the plush eyeballs ripped from elves and snowmen and polar bears — we still love these ruinous little Grinches, which is why we agree to buy them their own dumb gifts and even put them in their own stockings. Leo and Baby don’t deserve the gifts one bit. Maybe this year I’ll teach them a lesson and re-gift them something crappy, like a fruitcake. That’ll show ‘em. Kara Martinez Bachman is a married mom to two human kids and two shelter dogs. She is author of Kissing the Crisis: Field Notes on Foul-Mouthed Babies, Disenchanted Women, and Careening Into Middle Age. For more information, visit karamartinezbachman.com. The post Do Your Dogs Try to Ruin Christmas? Mine Do, But I Love The Little Grinches Anyway appeared first on Dogster.